Access the map screen in order to progress the game. Select character icons along the map to trigger events corresponding with main and sub-characters. 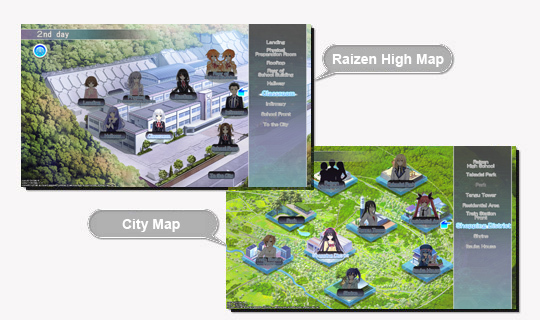 Switch between the Raizen and Town Maps to find a heroine to take on a date! Each day brings a chance to unlock new events and CGs with every main and sub-character. Time is limited, though, so choose how you spend it wisely! are rendered with movement functionalities. Watch characters react and express themselves in real time!